Ben Lake celebrates his opener against Fife Flyers. Picture by Scott Wiggins. Shawn Pauly scores the final goal of the victory. Picture by Scott Wiggins. Coventry Blaze celebrate the win over the Flyers. Picture by Scott Wiggins. Ross Venus bears down on goal. Picture by Scott Wiggins. Matt Hackett lies dejected on the ice after being beaten by Patrick Dwyer in Saturday night's game. Picture by William Cherry. Alex Nikiforuk attempts an effort for the Blaze. Picture by William Cherry. Matt Hackett gets down to make a save. Picture by William Cherry. 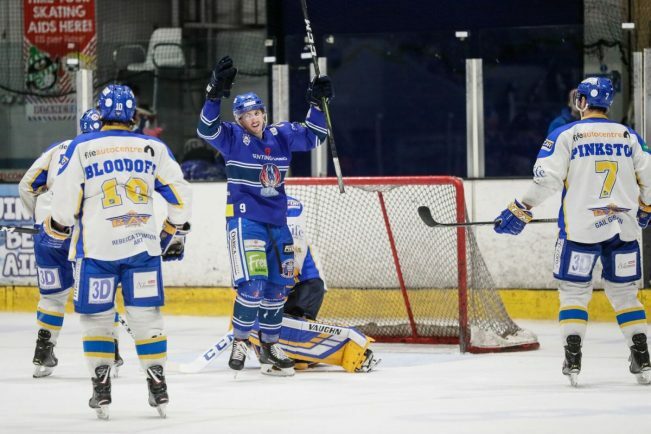 Patrick Dwyer celebrates his winner against the Blaze. Picture by William Cherry. 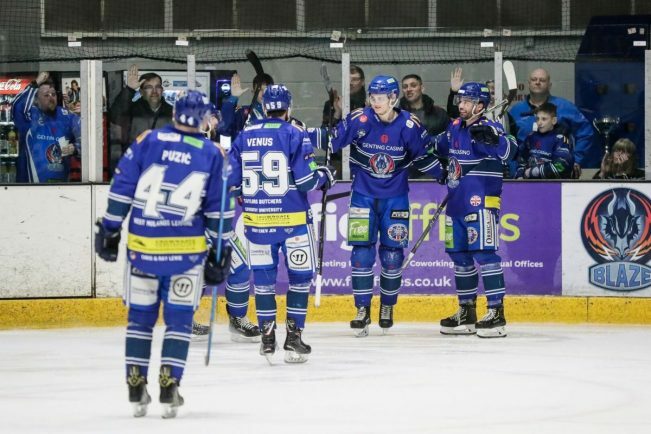 Coventry Blaze celebrate Ross Venus' goal on Friday night. Picture by William Cherry. 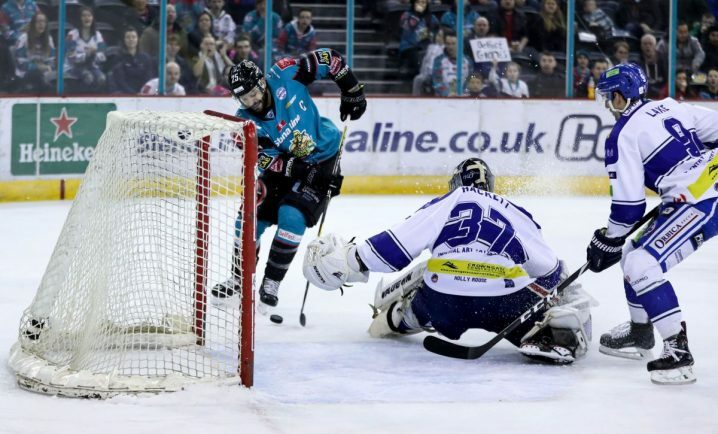 Belfast Giants' Blair Riley opens the scoring on Friday night, beating Matt Hackett. Picture by William Cherry. 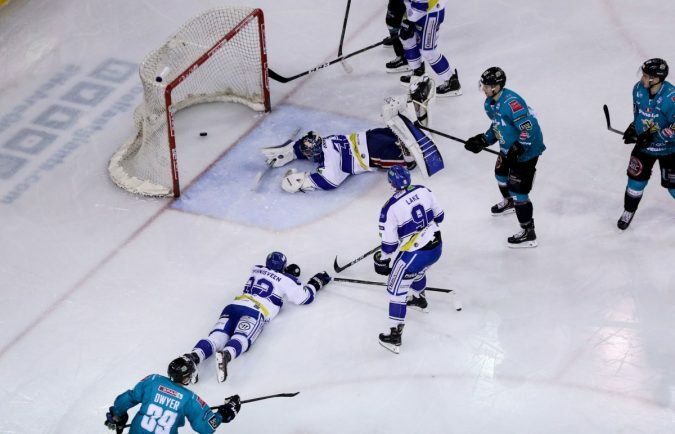 A scramble ensues in Coventry Blaze's goalmouth. Picture by William Cherry. 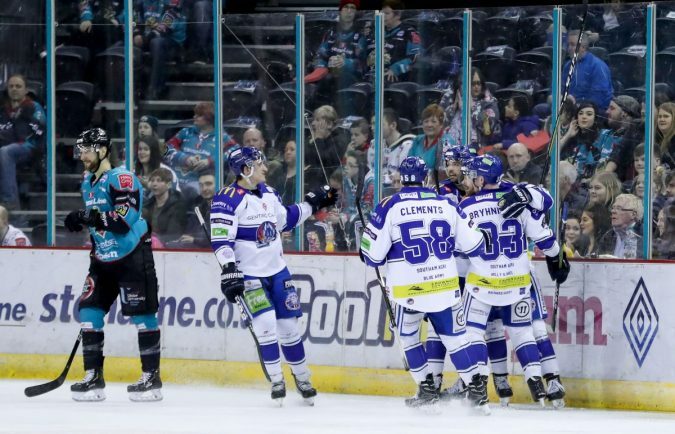 COVENTRY Blaze recovered from a double-loss to second-placed Belfast Giants to beat Fife Flyers 4-1 on Sunday to keep up the heat in their chase for an Elite League play-off place. 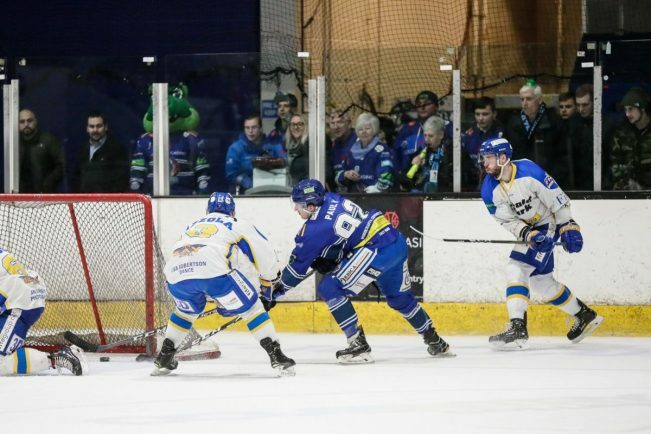 The three-game weekend was capped off with a blistering fourth period in the final game, when Blaze’s devastating attack provided clinical finishing to take the all-important points. 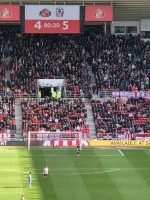 Head coach Danny Stewart was understandably elated with the response of his side to battle to the very end, and end the extended weekend on a positive note. “I can’t credit these guys enough. “To put in that performance after Belfast, especially on the back-end in defence, was outstanding. Coventry displayed no signs of fatigue against the Flyers, and for the majority of the night were denied by the impressive Shane Owen in goal. 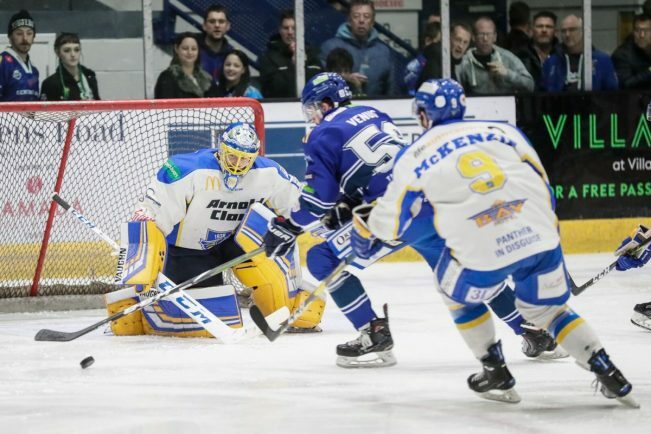 With the pipes hit numerous times and an equal amount of superb saves from the two netminders, the hosts struck on 42.49 through top scorer Ben Lake with his 31st of the season. The opener was laid on by Alex Nikiforuk with his 50th assist for the Blaze. Dillon Lawrence doubled the scores on 46.31 with a quick wrist-shot, before Nicolai Bryhnisveen killed off the game on 48.27. Hackett’s clean sheet was gone when Marcus Basara narrowed the deficit to two (54.12), but Shawn Pauly’s 20th of the season (58.36) made sure of the victory. 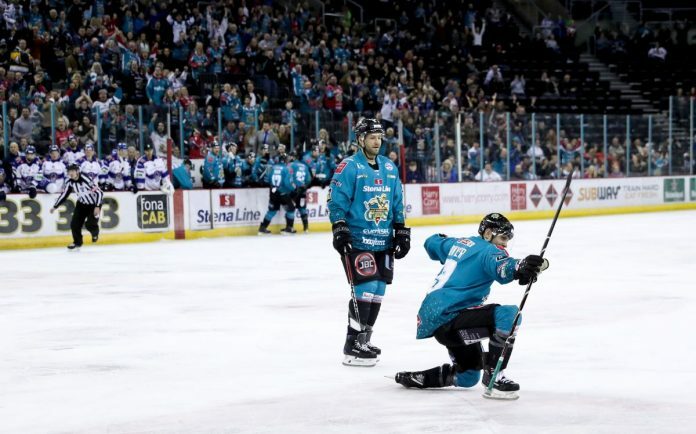 Saturday’s fixture against the Giants was a close-fought affair, as former-NHL player Patrick Dwyer’s double helped edge Coventry in a 2-1 loss. 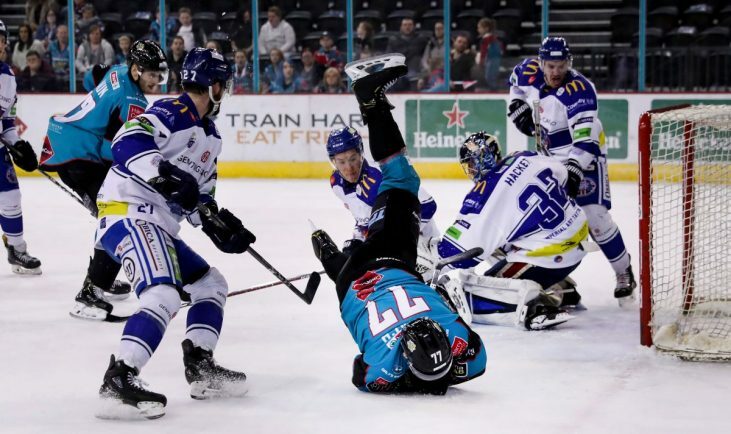 The teams lined up without any changes for the second consecutive night in Belfast, with Stephen Murphy denying Blaze on a couple of occasions in the early stages of a goal-less first period. An opener came courtesy of Kyle Baun’s assist to set-up Dwyer’s powerplay strike (24.47) past the outrushing Hackett, a goal which failed to halt the progress Coventry were making in the attacking third. Nikiforuk and Kevin Morris were both denied by Murphy, before their side fell further behind to Dwyer’s second goal of the night (48.00). 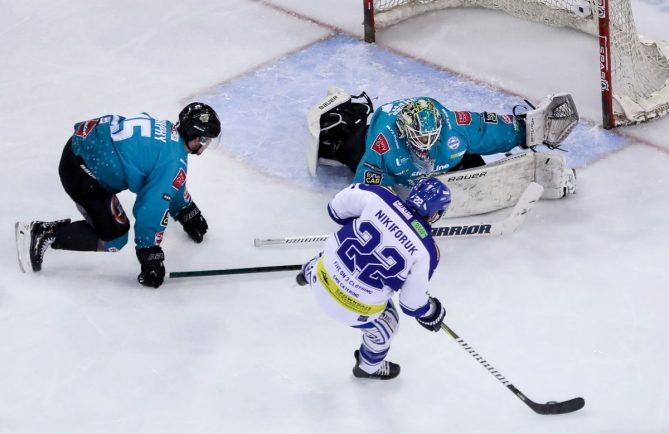 Luke Ferrara got lucky when his cross-ice pass was deflected into the net by the Giants’ Josh Roach during a powerplay, meaning it was game on once again. But despite the visitors best efforts, that would be the last goal of the net as the buzzer sounded for full-time. 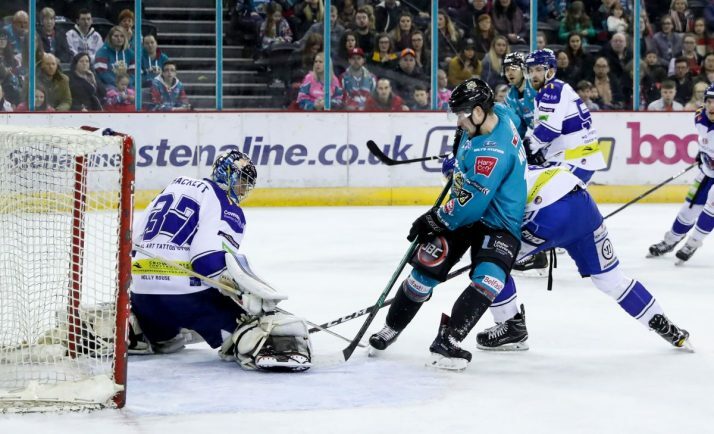 Friday night’s game at the SSE Arena was a much more straightforward affair, with Coventry losing 4-1 in the first game against the Giants. Blaze squandered four powerplay chances in the opening period and were punished by Blair Riley’s strike on 14.19. There was still time prior to rink maintenance being enacted on the surface for Darcy Murphy to make it 2-0 (19.44) to make Coventry’s situation bleaker. Ross Venus, man-of-the-match for Blaze, found a way past Murphy (26.53) to make it 2-1, whilst Bryhnisveen crashed the puck against the post on the half-hour mark. Venus was denied with two further opportunities, as Murphy struck Hackett’s crossbar, but there seemed to be no way past Belfast’s goalkeeper for a second time. As Coventry threw numbers forward in desperate fashion in the closing seconds, Hackett’s unattended net allowed Jordan Smotherman (59.16) and Baun (59.57) to score the goals to put the contest to bed. The weekend’s results leave Blaze level on points with Manchester Storm in the final play-off position, but just outside the top eight. Stewart’s men do, however, have a game in hand on the Storm, and were back in action last night (Wednesday) away to Dundee Stars, before visiting Guildford Flames on Sunday (6pm).